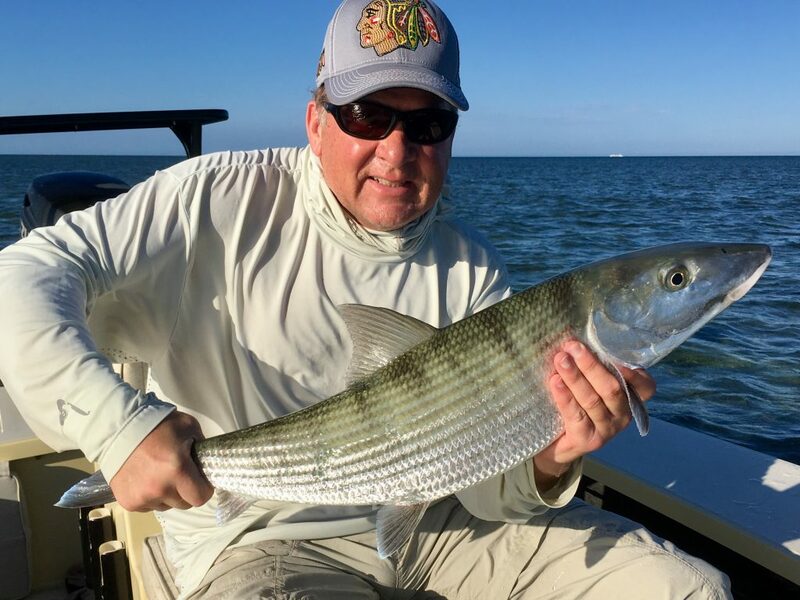 Mark likes to book me for night tarpon fishing charters that I launch my boat from Crandon Marina on the island of Key Biscayne. As we are heading out, all of the other Miami fishing guides are coming back in for the day. We get to fish Biscayne Bay by ourselves. We first go for bone fish, but not fly fishing yet. We were fishing with bait and caught four of them in a few hours. The best one this evening was 28″ and nine pounds. As the sun set, we headed back into north Biscayne bay, deep in shore Miami where we would be protected by the 25mph north winds, that we had blowing that night. After about ten minutes of fishing we could hear some tarpon blasting shrimp. 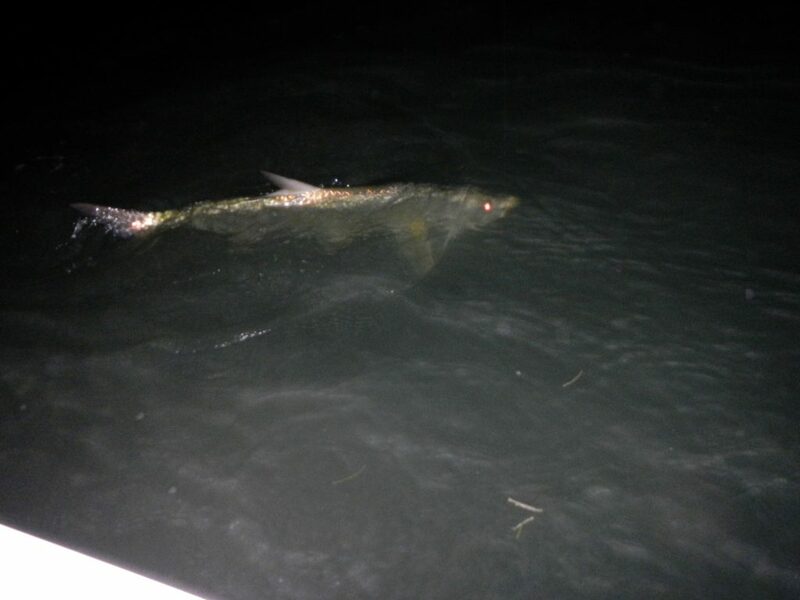 We knew that soon a tarpon would make a mistake and eat the fly. 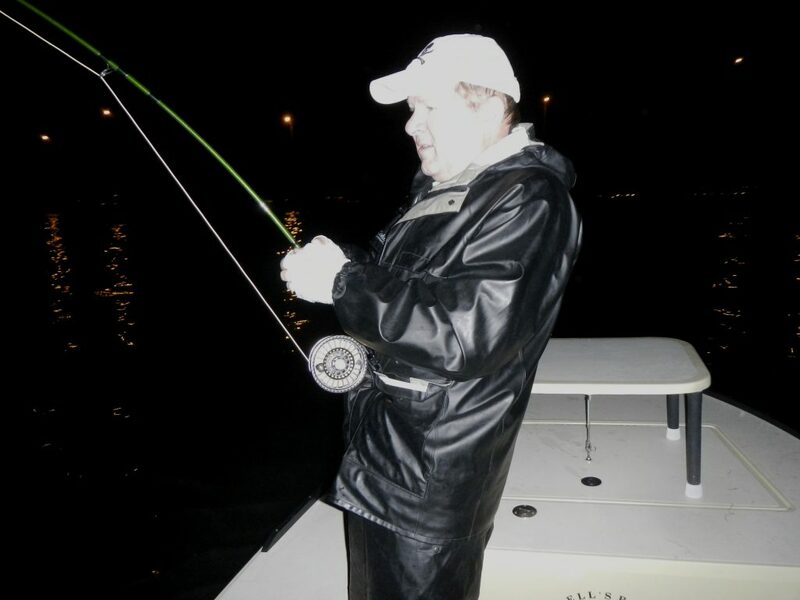 We then had a tarpon bust right on the fly, but it did not get hooked. A couple minutes later another tarpon hits the fly and Mark hooks this one. It instantly jumps in the air around thirty feet from the boat and throws the fly. We keep fly fishing and soon hook another tarpon. This fish stays hooked after about six jumps and some very long runs, getting deep into the backing of Marks fly rod. After about a thirty minute battle the tarpon is getting close to being landed. When all of a sudden a bull shark swims right by the boat. This bull shark looks to be around seven to eight feet long and large enough to kill this tarpon that is around one hundred pounds. The bull shark swims through my navigational lights again and just seconds after that shark, another bull shark swims right behind that one. The second bull shark is gigantic, at least ten feet long and well over five hundred pounds. So as always the policy is that we don’t let any tarpon get eaten. With two bulls sharks that have shown themselves in the dark, there is no telling how many others are out there that we can’t see. So Mark grabs the spool of his Tibor Gulfstream fly reel and breaks the tarpon off. I run the boat over the area where the tarpon was just at before, to try to confuse the sharks and get them off the tarpons trail. It’s always amazing to me when you see such big sharks inshore Miami with all the million dollar homes and condos around.